I have fretted and fretted over this issue. Especially considering the way our horses are living, out 24/7, grazing most of the time, just as they would be doing in the wild. And I’ve wondered if the need for equine dental work didn’t evolve from horses not being allowed to live and graze according to their genetic design. Like living in stalls and eating from a bag. So I’ve procrastinated, and avoided, and let time slip by, but in the end I’ve never had the guts to just say no. Because, even though I’ve never found a really good answer as to why a horse should have his teeth floated every year, I’ve also never been able to find a good answer as to why he should not. Until today. During several of my talks and presentations I have expressed my lack of knowledge in equine dentistry. I have the hooves figured out for sure and the back/saddle fit issues are for the most part pretty simple for me to explain, but I knew I was missing a piece of the puzzle – the 3rd “Hot Spot” for horses, the mouth. And it’s big. It’s monstrous. Have you ever looked in there? That jaw goes on forever! 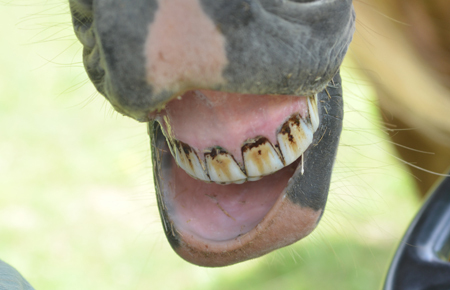 So every Spring it’s time for equine dentistry. Anesthetic. Power tools. Sometimes blood. It’s one of those things that I’ve gone along with because I don’t really know what else to do. And here’s the thing I am embarrassed about – I do it because everyone else does. Yes, me. The lady who says, “Don’t be a sheep. Don’t do things just because they have always been done that way.”….. except for dentistry? No methinks there’s a better, kinder, more natural, more evolutionary and intelligent way to go. So the other day, through an introduction from a good friend, a very interesting man (who shall remain nameless for now, because some traditional practitioners are feeling a bit put out by his alternative approach) arrives on my property, looks into my old boy’s mouth and begins to divulge some very fascinating information that rings profoundly true. You know how sometimes when you hear truth, you know beyond doubt that it’s true? He tells me that teeth only grow about 3 to 4 inches in a lifetime and that as horses age they start to compensate for their lives; bumps, bruises, feed programs, bits, riders, where they live etc. by growing their teeth in a way that allows them to masticate their food. Maybe a little jagged here and there, with some spaces and imbalances, but it works for them because they are survivors and adaptable. Then a dentist comes along and vroom OFF come the edges and anything that doesn’t look level and the horse can’t grow it back again. 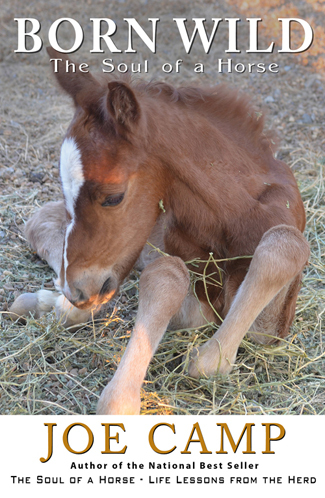 Over time more and more tooth is removed and your 30 year old horse starts having a hard time eating. Big problem for a horse! Could you imagine if hoof growth was finite? You’d be pretty careful about who you let near your horse with the nippers! So “Mr. Interesting” didn’t take anything off old Slash’s teeth and said he’d be back in a year. He explained some other things about natural lifestyle and the importance of grazing. He gave me some resources to study re my now new fascination for horse’s teeth and he drove off with his own pearly whites shining through a big smile, both of us comfortable in knowing that our industry just got another step closer to a better place for horses and the people who love them. As I find out more, I’ll be sure to let you know. Thank you Carole! Terrific new insight! I’m not saying that it isn’t wise to get those “pearly whites” checked every year or so, as Carole does. Just as a caution. During one such check we discovered that Cash had a tooth that was split right down into the gum and it needed to come out. But from now on there will be no such thing as routine floating or balancing. And if a “point” is not in such a position as to be causing a problem for mouth tissue it won’t be touched. I had to smile as all this unfolded because it’s just one more puzzle piece that fits neatly and logically into the Wild Horse lifestyle. As we say over and over, the answer to virtually every question about the horse can be answered by asking: How would the horse be dealing with this if he or she were out in the wild of the American west? But so very often we humans want to think we are smarter than God, and Mother Nature. And the horse. 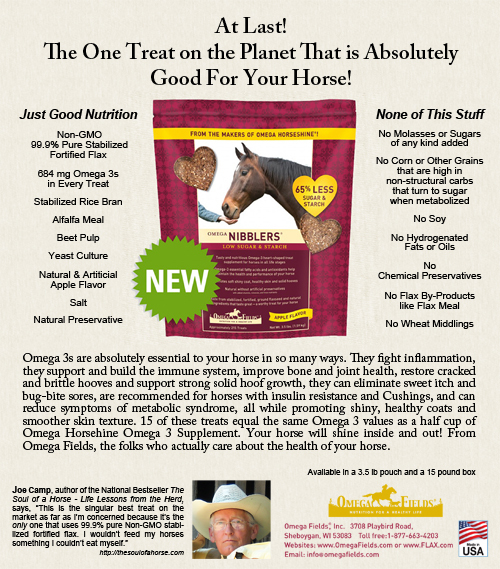 and receive a free PDF copy of Joe’s book Training with Treats! 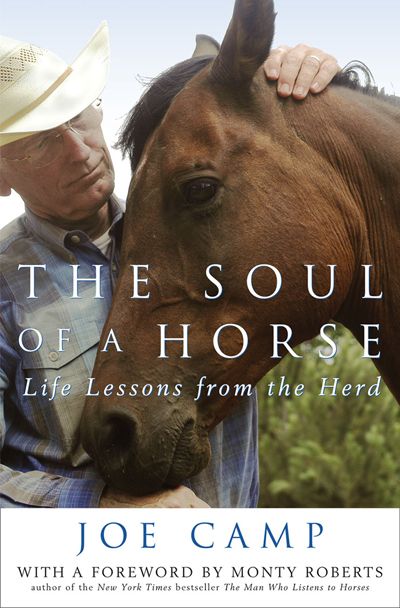 The story of our journey with horses (to date) is told in the two books that follow: the national best seller The Soul of a Horse – Life Lessons from the Herd and its sequel Born Wild – The Journey Continues.